JEREMY WADE (voice over): ...and extreme angler. MARTIN: ...And I'm Jeremy's producer, Martin Perchbritches. 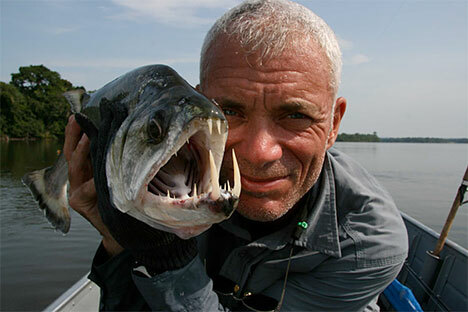 Tonight, we're going to show you just what goes into to making an episode of River Monsters. MARTIN: ...and does all this with a doggedly loyal camera crew in tow. MARTIN: All because of the tremendous spirit of one man (turns to look at JEREMY), Jeremy W... wait a tic, where's he gone? MARTIN: Jeremy can get very excited when he's fishing. It's up to us to balance that energy and the demands of a one-hour show. MARTIN (voice over): For example, most of his larger catches take a tremendous amount of time to land. MARTIN (voice over): Depending on how much sleep he's had and how good a breakfast, Jeremy can go on shouting about a catch for quite a long time. MARTIN (Without looking behind): ...never knowing what might come out. MARTIN: (Voice over) We spend hours looking at potential river monsters and setting up new challenges for Jeremy. MARTIN (in shot): How about piranha, Jeremy? Would you be willing to stand in a river with them? JEREMY: Well, unless they're agitated it might be all right. MARTIN: How about the flesh eating longfin eels? These things bunch up in swarms.Would you swim with them? JEREMY: The right kind of suit and protective clothing, and it would be just fine. MARTIN: What about this fish, the red bellied Pacu? Would you be willing to get in the water with that one? It's said to have bitten off a man's willy. JEREMY: (Falling out of chair) (Expletive deleted) no (Expletive deleted)! You get in the (Expletive deleted) (Expletive deleted) water with those (Expletive deleted) (Expletive deleted), you (Expletive deleted). (Long pause) Still, it would give a new meaning to the phrase, "Fish on!" MARTIN (voice over): Jeremy always has a wonderful sense of humour about these things. MARTIN: There were some episodes that didn't work out. For example, tracking down the Kraken. MARTIN: He would have had the Kraken, if only he'd brought his 20,000 lb. test reel. Instead he went with the lasso and harpoon. (Long pause) It cost him his parrot. MARTIN (voice over): He was inconsolable.